John Scalzi's latest novel Fuzzy Nation opens with a bang: Holloway, a disbarred lawyer turned prospector has his dog blow up a cliff while in search of precious stones on Zara XXIII, only to be fired when he overdoes it. So begins an entertaining and smart novel, one that feels highly relevant to the modern day. It's a novel that has no right to be as fun as it was. Holloway, an irritating man to all around him (think Sawyer from the show LOST - if this is ever made into a film, he's the perfect actor. Even better, they share names), is let go from his mining contract when he potentially costs the Zarathustra Corporation a considerable amount of embarrassment and money, only to reneigotiate his contract when it turns out that he's hit the mother load when it comes to Sunstones leading him to potentially become one of the richest men on the planet, and yielding the company trillions of credits. That is, before a small creature breaks into his cabin, one that turns out to be deceptively intelligent. Many of the plot points in the story won't come as a surprise: anyone who has watched the news in the last couple of years will recognize the motives of an enormous company and the lengths that they'll go to to ensure their profits in the short term. Fuzzy Nation comes along like clockwork as Holloway's 'Fuzzies' are looked at as a major threat if intelligent, as conspiracies emerge and the lawyers are trucked out to protect the company. Fuzzy Nation is a remake of H. Beam Piper's novel Little Fuzzy, but both books, while sharing plot points and characters, feel like entirely different novels. Largely gone is Piper's musings on intelligence and alien life forms, replaced with a far more straightforward and somewhat abbreviated version in Scalziverse. Where Piper was a bit more deliberative, Scalzi has amped up the story and sent it running on its own. Both work really well, and both stand on their own. However, this novel brings out an excellent example in how remakes and reboots function. 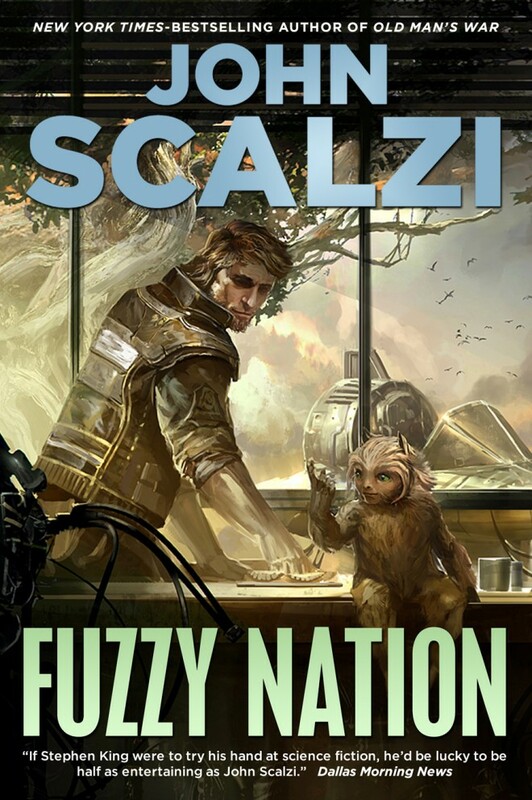 Fiction and art is created and informed by events around it's time of creation, and the context for Piper's Little Fuzzy and Scalzi's Fuzzy Nation are from very different times. Where Piper's book comes off as a story on intelligence, Scalzi goes to corporate responsibilities and the regulations that restrain them, although elements of the intelligence storyline are still there, just as there are elements in Little Fuzzy about corporate interactions with the environment. The result seems to be as Scalzi intended: take an old story that doesn't really fit with how we now see the future, and update in his own vision. This new Fuzzy story feels more relevant to the modern day, extending beyond the window dressing of objects (touch screens, computers, space ships etc) and to the dominant themes that deal with environmentalism, free market economies and the role of government in those two things. And more importantly, where there's plenty of material there to absolutely kill a story, Scalzi makes it excel. This is a story that I found agreeable, not only for the themes (which have been popping up in other science fiction stories, from Avatar to Moon) but for the characters. Scalzi's Holloway finds himself in problem after problem, but a driving component of the story's plot is his ability to think fast and solve problems, not through force or a whole lot of action (although there's some there), but with his knowledge of the legal system and logic that helps him gain the upper hand. It's a story of a small man against a large company and it's a gratifying thing to watch as the story unfolds. There’s a whole host of supporting characters, but Holloway (and Chad), really steal the show. This is also probably the most fun that I've had reading a book in a long while. Readers of Scalzi's blog, Whatever, will recognize his prose, and it feels very much like this was a book that he had a blast writing. It's funny - I found myself laughing to myself every couple of pages as some familiar references: Holloway screening Return of the Jedi for the Fuzzies, and later, frying up bacon for them. Carl, Holloway's dog, is also a character in and of himself, stealing the show with his own imagined dialogue whenever he's in the scene. Think Dug, from Pixar's movie Up. Fuzzy Nation is a fun, quick book, but one that's a good exercise in writing and in looking at the genre, especially when looking at a larger context for what helps to frame a story in the first place. Scalzi's long been on the record for just wanting to tell and sell a good story, and this one certainly meets that description, telling a fun story but with greater themes and plot elements that makes this book a strong, smart and thoughtful one.